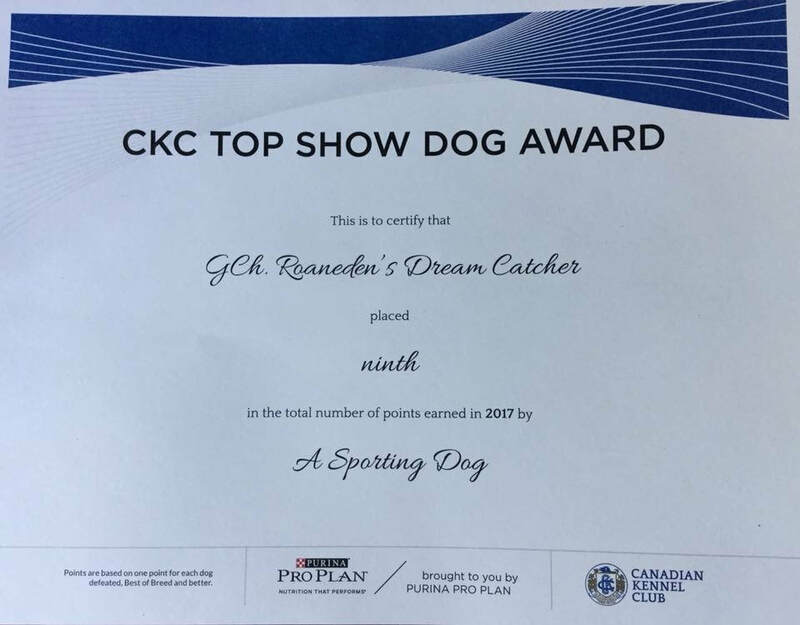 Falco wins the Canadian National in 2017, and in 2018 wins two CKC All Breed Best in Shows ! Falco is our flashy pick male from our "Ducks Character " litter between our Tink and Mini Cooper from the US. 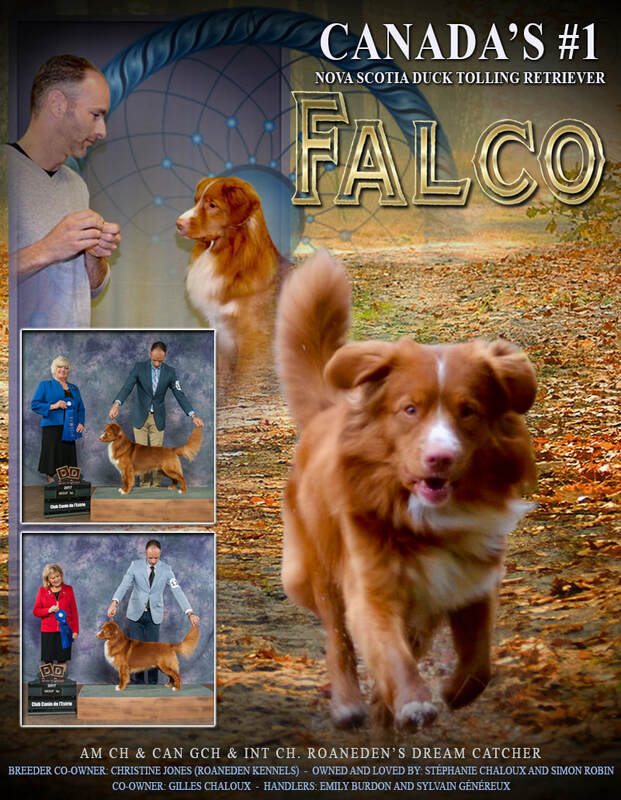 Falco is a high energy boy who gives 100% at everything he does. 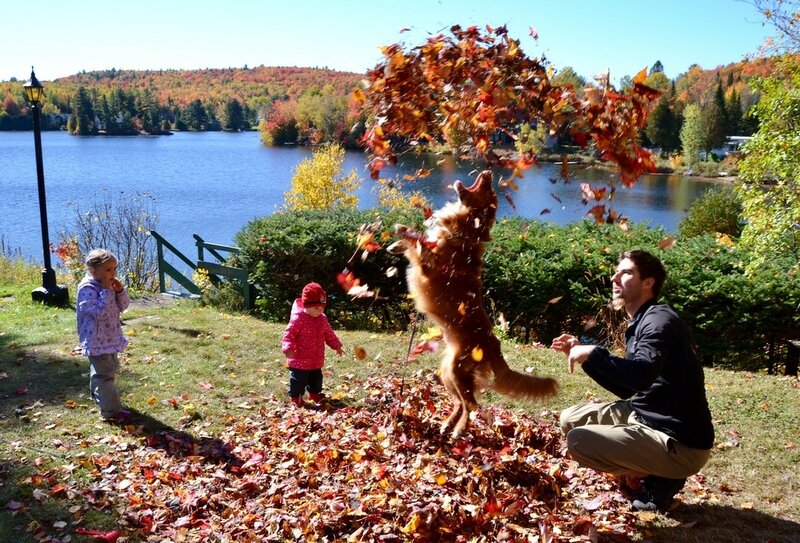 He is so much fun and much loved by his family. Falco is very kind with children and other dogs. He has personality plus. 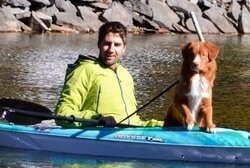 Falco is highly trainable! He has a long list of tricks and talents! 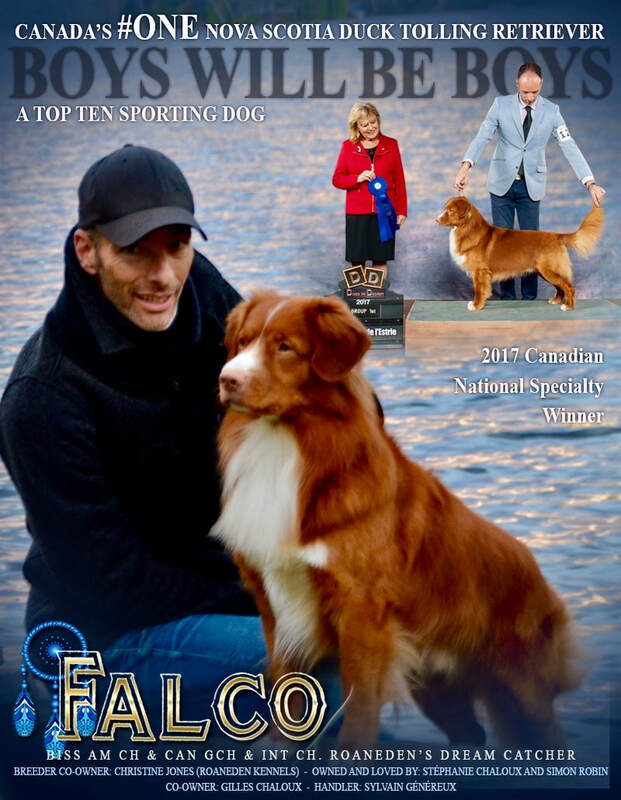 Falco goes in the history books winning the Canadian National Specialty Aug 27 '17 ! 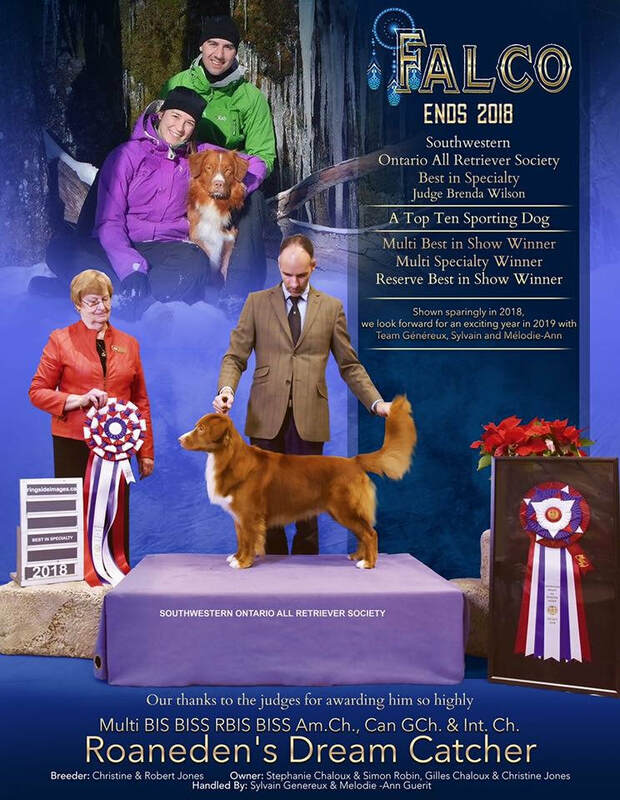 He is a Multiple Group Winning Dog and a Multiple Best in Show winner ( All Breed CKC - 3 to date ) to his list of accomplishments as of February 2019 !!!! 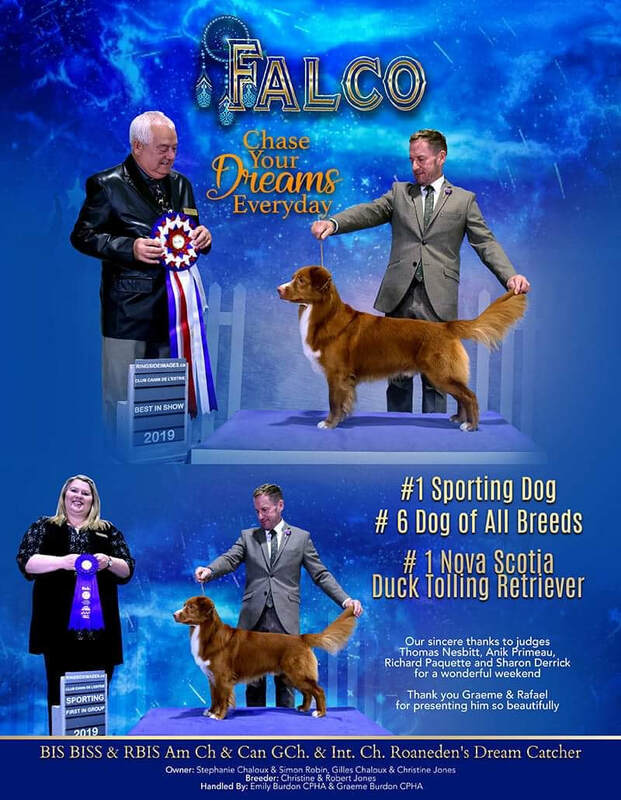 FALCO IS CURRENTLY #1 Sporting Dog in Canada and #6 of All Breeds !!! 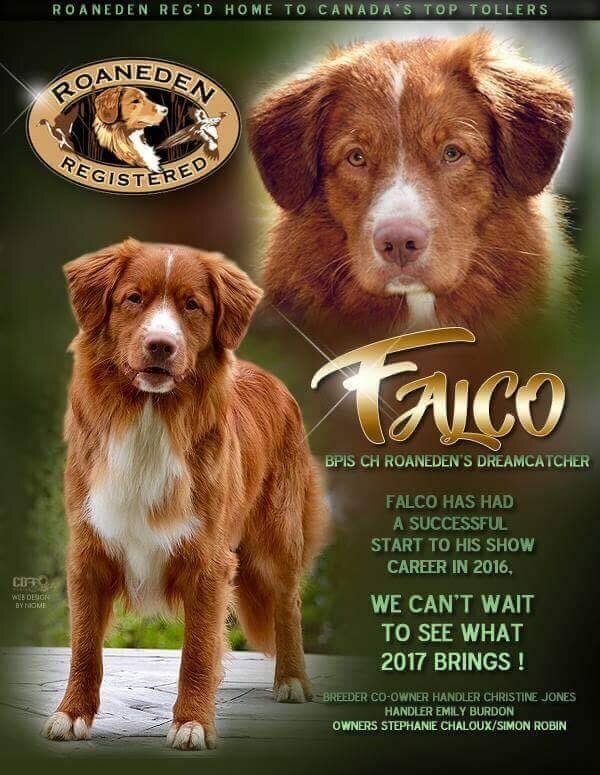 Falco will be Campaigned in the Show Ring in Canada and at select Big Shows in the US in 2019. 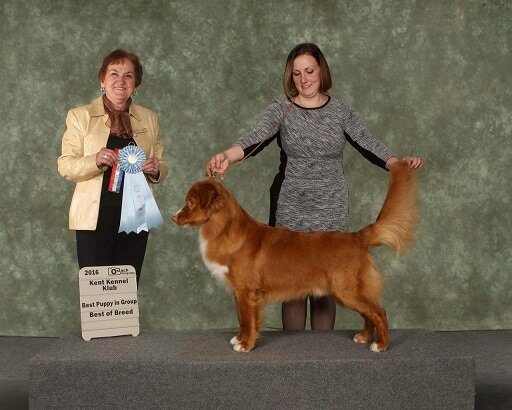 Falco has exeeded our hopes in the show ring as a puppy, handled by Emily Burdon! 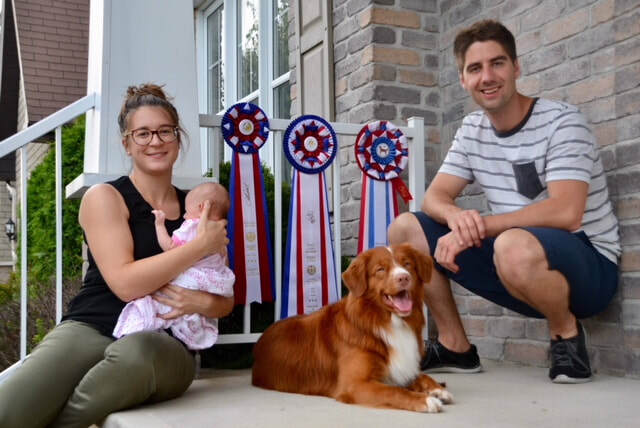 He finished his Canadian Championship undefeated in the classes with Multiple Group placings, Multiple Best Puppy in Group Wins and Best Puppy in Show! 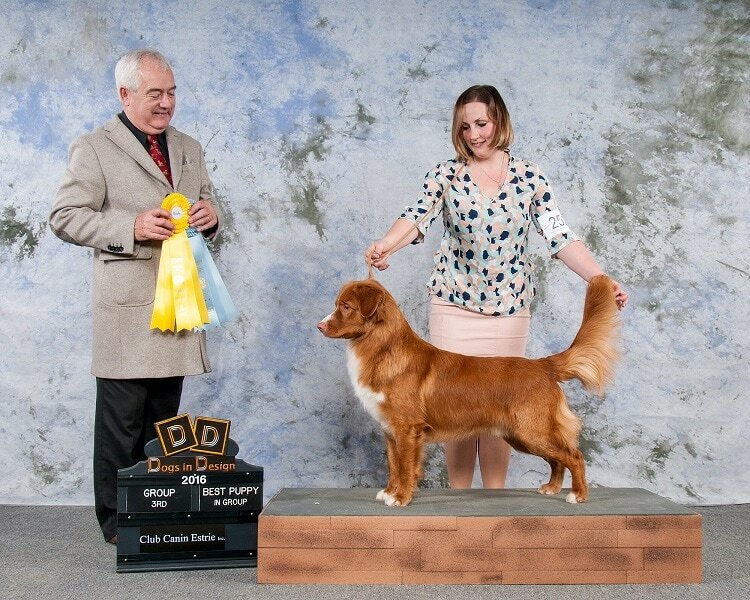 Falco finished his International (FCC) Championship in one weekend with four Best of Breeds and four Group placements. 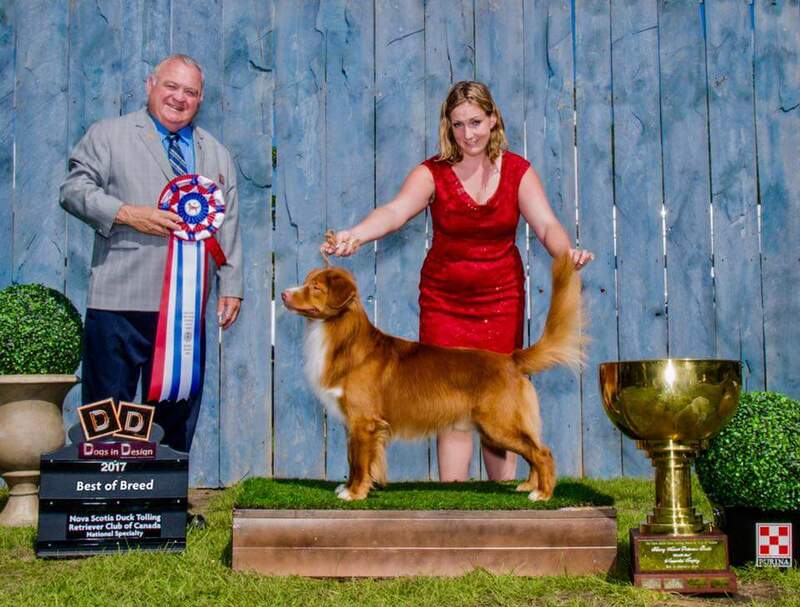 He earned three consecutive majors his first weekend showing in the Us, with two Best of Breed wins and Best of Winners/Best of Opposite. Falco also made the cut in the Sporting group. 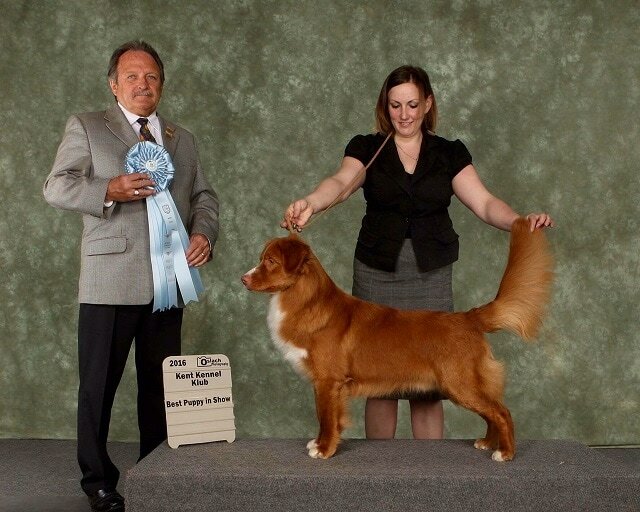 This earned him at 14 of 15 AKC points and all required majors ! 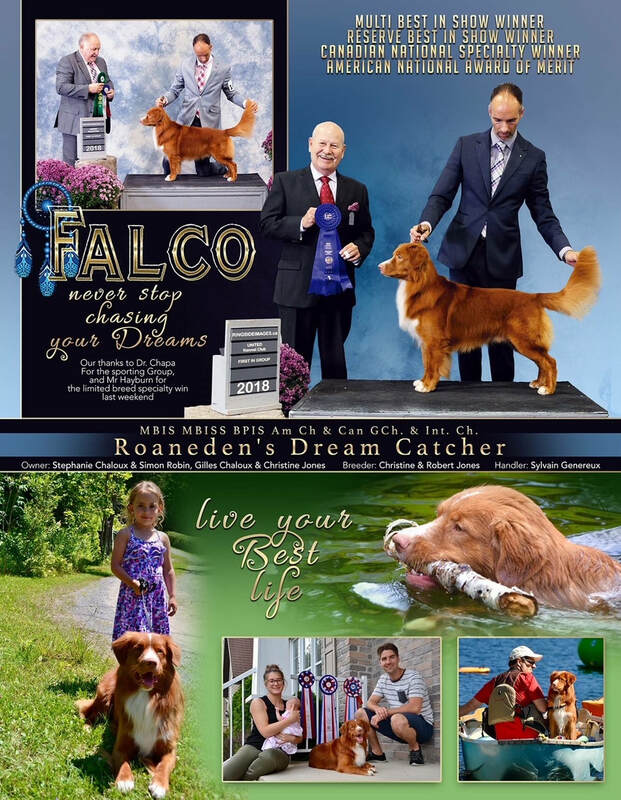 2017 was an exciting year for Falco and Roaneden. 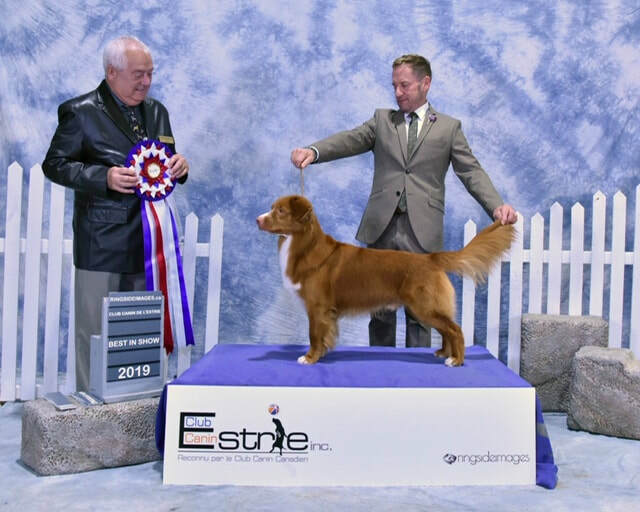 He was shown to complete his Us Championship and was Campaigned in Canada to #1 Toller in Canada and #9 Sporting Dog in Canda. 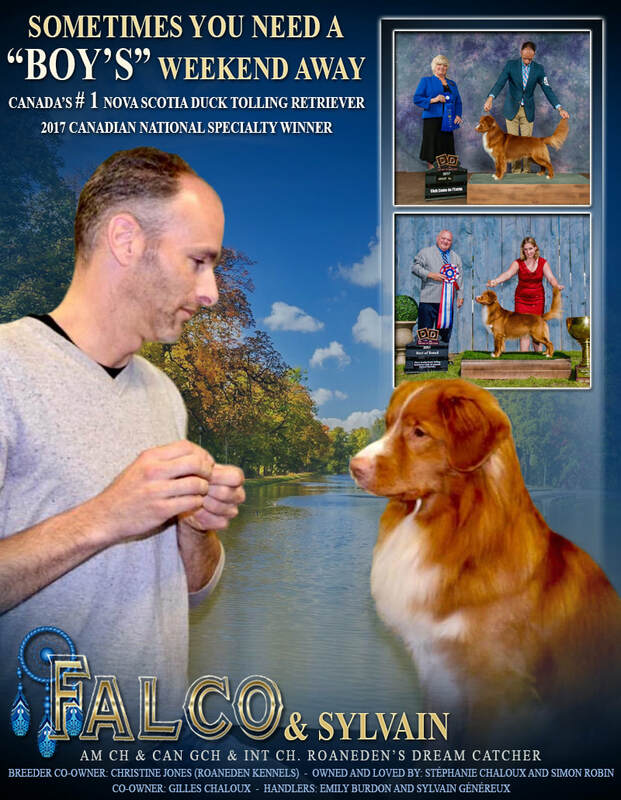 Falco also won the Canadian National. 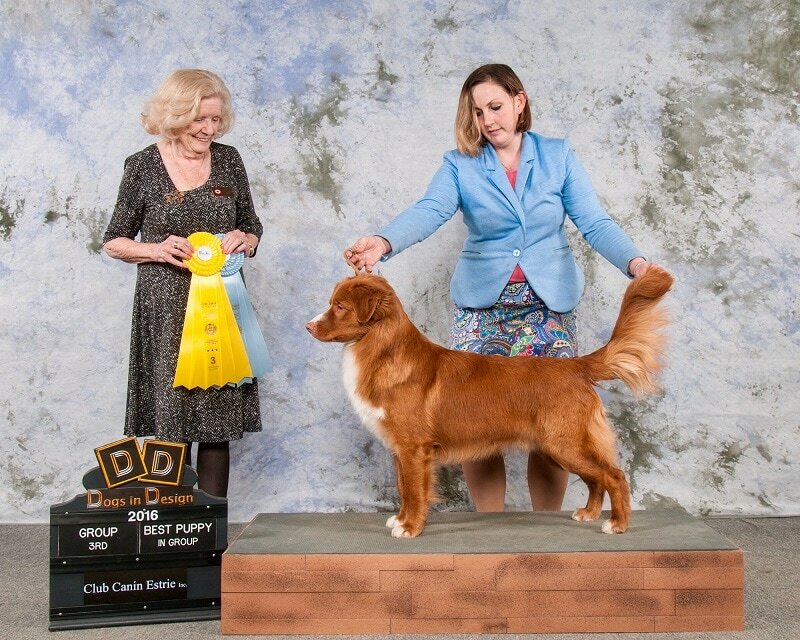 He will be working towards his CKC Grand Championship Excellent. Stephanie and Simon have big plans in the Agility ring with Falco, so a well rounded and busy year !!! 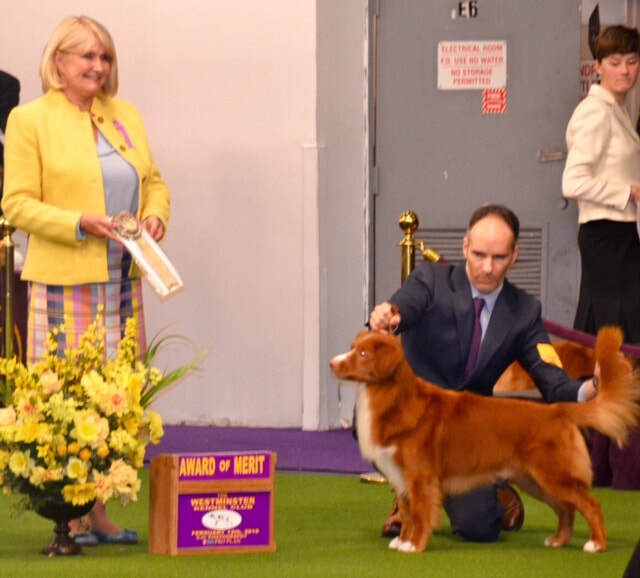 *Feb'19 - Wildwood Kennel Club Shows - Falco is awarded his 3rd BIS win, two sporting group 1st, a 2nd and a 3rd. 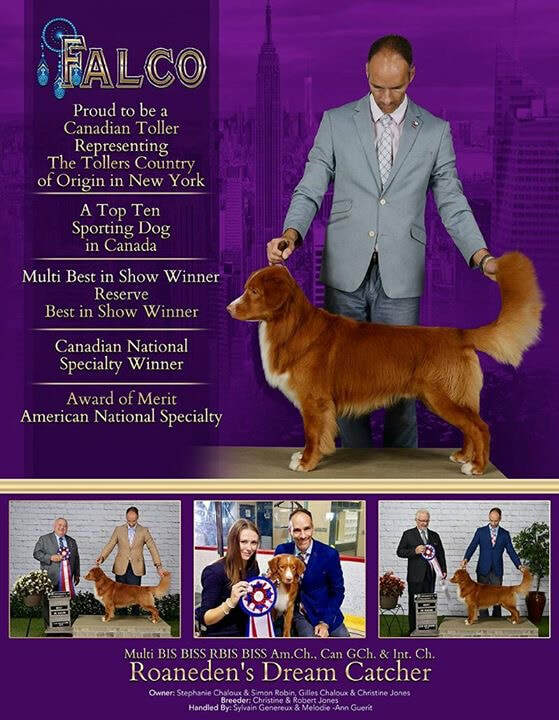 Starting the year off as #1 Toller in Canada and a Top Sporting Dog! 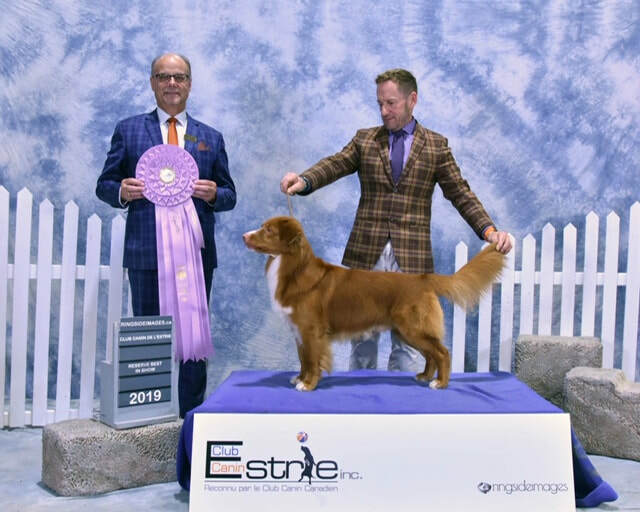 *Dec'18- Elora Gorge Kennel Club Show - Falco wins Best in All Retriever Specialty Show, picks up a Sporting Group 4 th and ends the year #2 Toller in Canada and a Top 10 Sporting Dog for 2018. 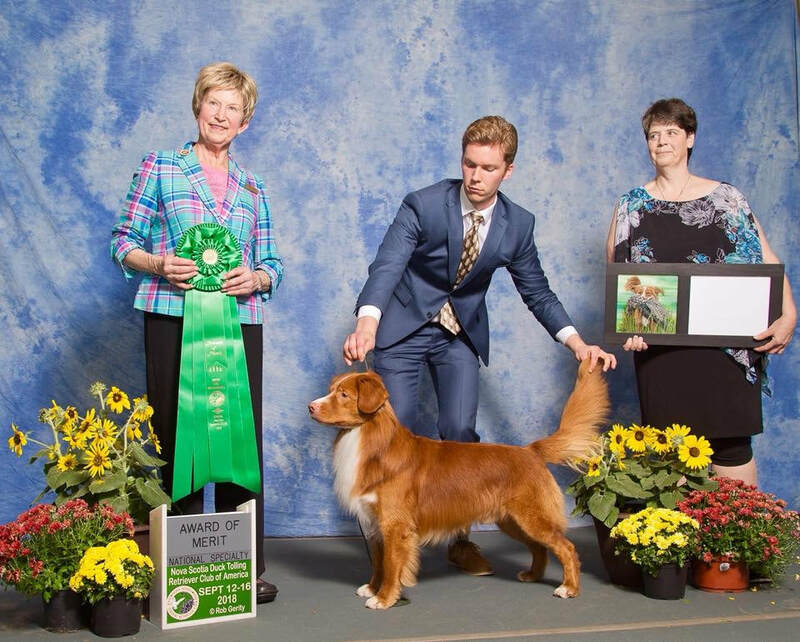 He was the only Toller to earn a Best in Show in 2018 ( which he won two ). 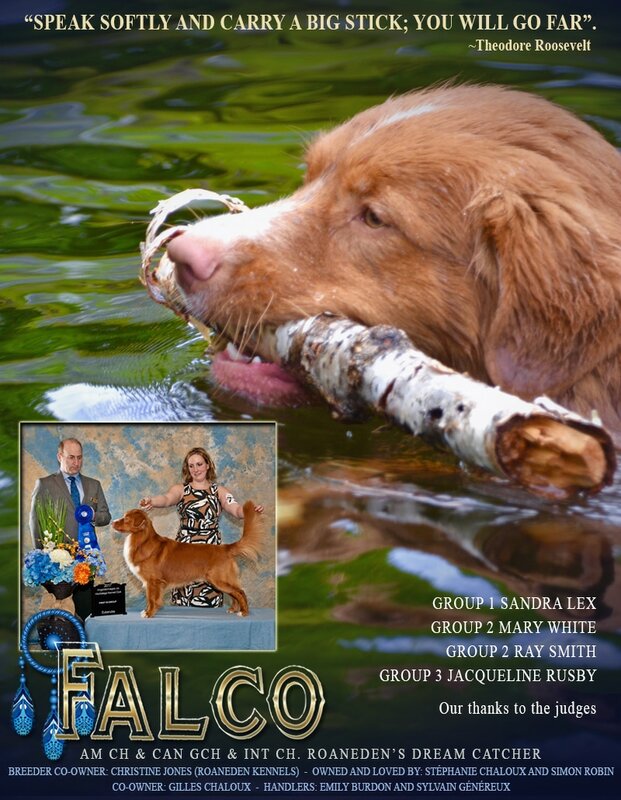 *Nov '18 - United Kennel Club - Falco is awarded Sporting Group 1 st, 2nd and Best in Limited Breed Show for Retrievers. 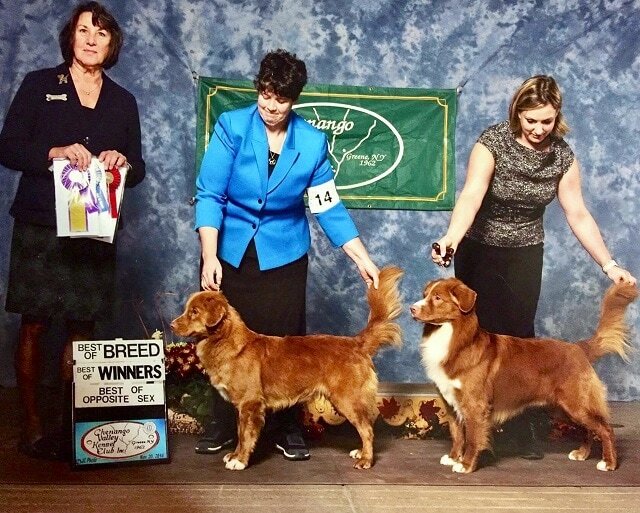 *Feb'17 Ontario Breeders Kennel Club - Falco wins 3 BOB and a Sporting Group 3 rd to finish his CKC Grand CH title! 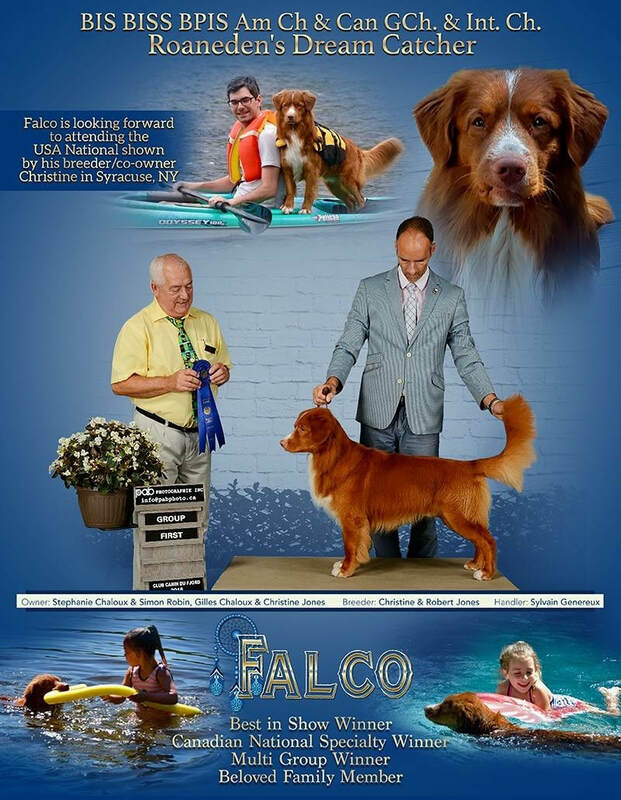 *March '17 - Syracuse KC - Falco wins Best of Breed over Specials to finish his AKC CH with a 4 th consecutive Major. 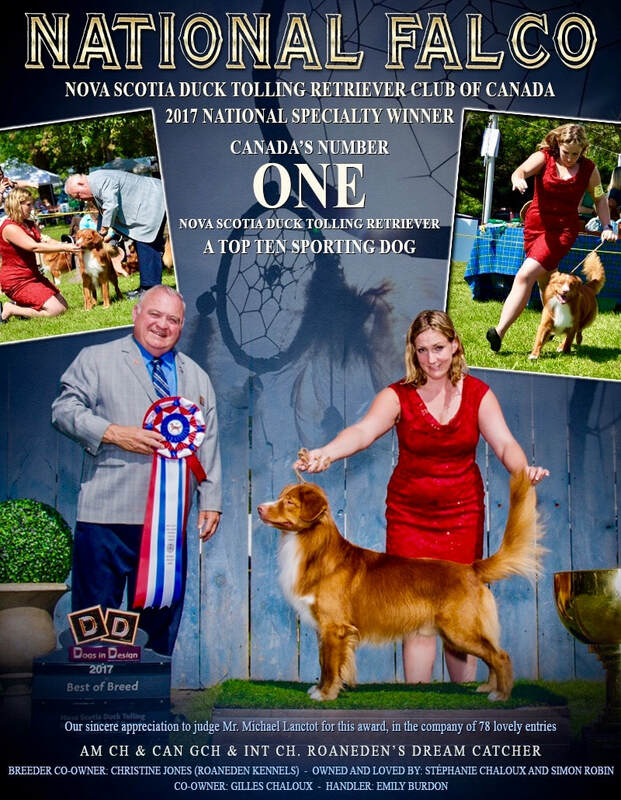 *May '17 - Hochelaga Kennel Club Show, QC - Falco wins Best in Limited Breed Show for Group 1, Sporting Group 1st and Sporting Group 2nd! June'17 - St Francis Kennel and Obedience Club - Falco wins another Sporting Group 1st, two Group 2 nd and a Group 3 rd! July'17 Chateauguay KC - QC - Falco wins three consecutive Sporting Group 1st and a Group 2. 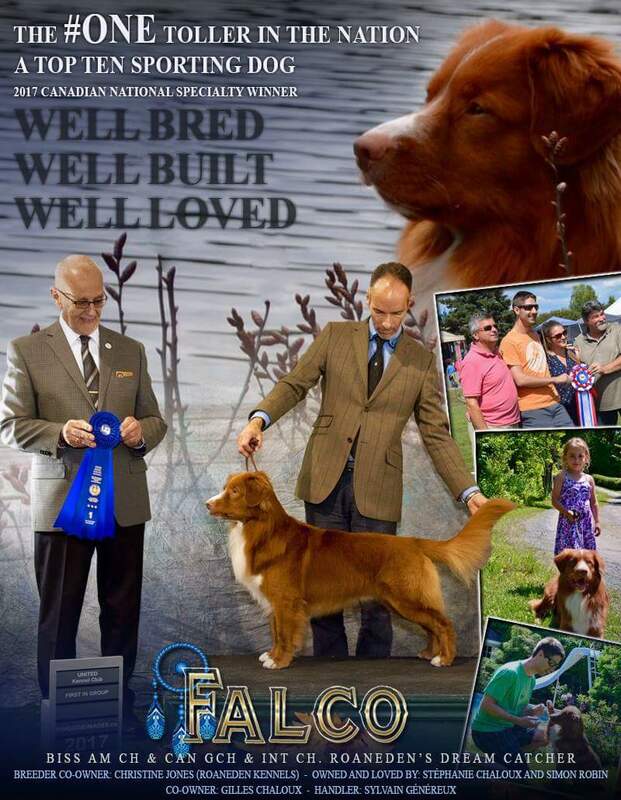 Aug'17 - SD & G - The largest show of the year, Falco wins the Sporting Group with over 200 Sporting dogs entered, a Group 3 and a Grp 4. 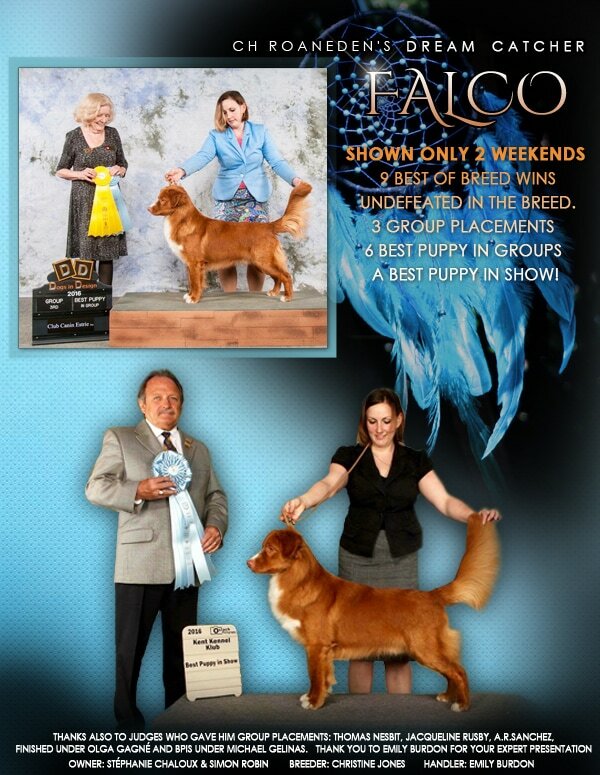 Falco was undefeated in the breed at all 6 Shows. 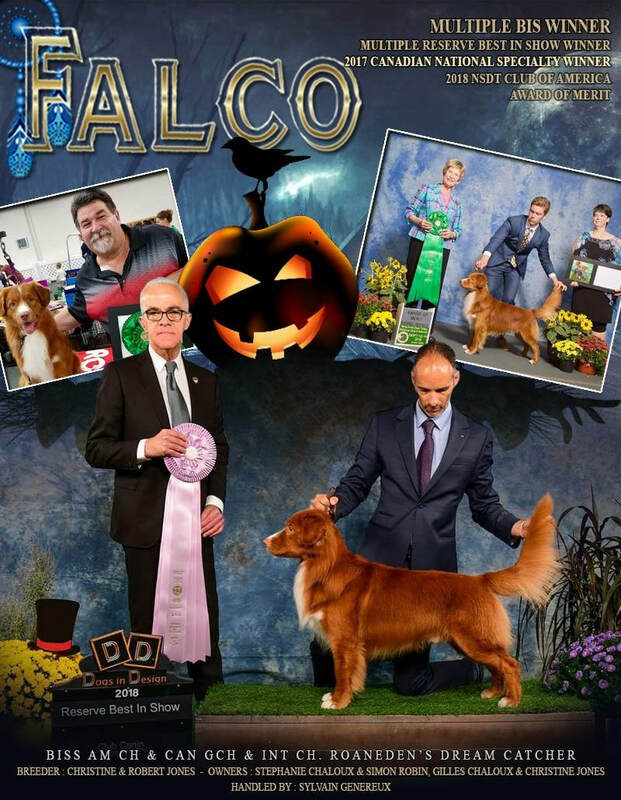 Falco also goes on to win Best in Specialty Show!!!! 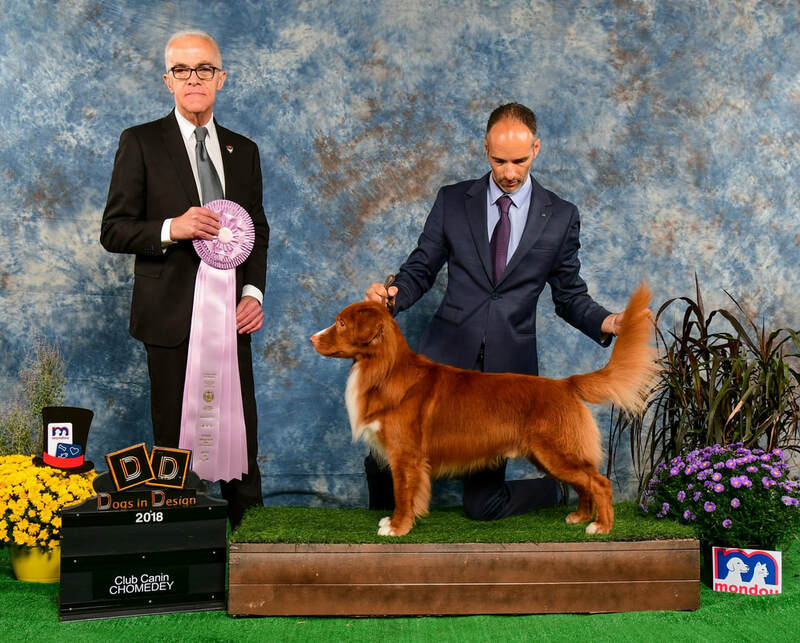 Sept'17 - FCC/IKC Shows QC - Falco is awarded 4 x Excellent ratings under European Judges to earn his Elite Championship. Sept '17 - Pine Ridge KC - Falco wins Sporting Group 2nd, 3 rd and 4th! Oct '17 - Nippising KC - Falco has another fantastic weekend with a Sporting Group 2nd, 4 x Group 3 rd and a Group 4 ! 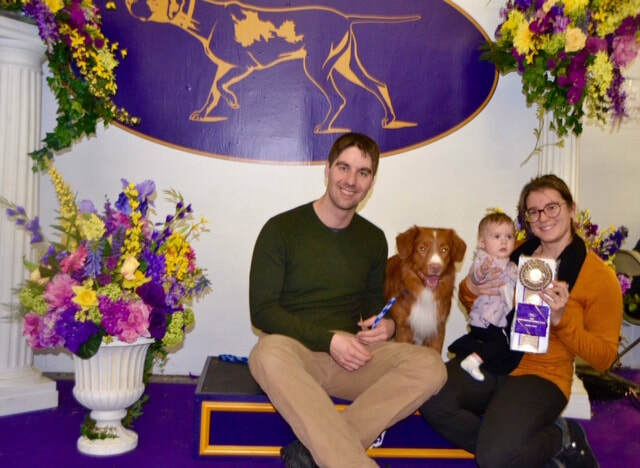 Nov'17 - United Kennel Club -QC-Falco wins Sporting Group 1 st, Group 3 rd and a Group 4th ! 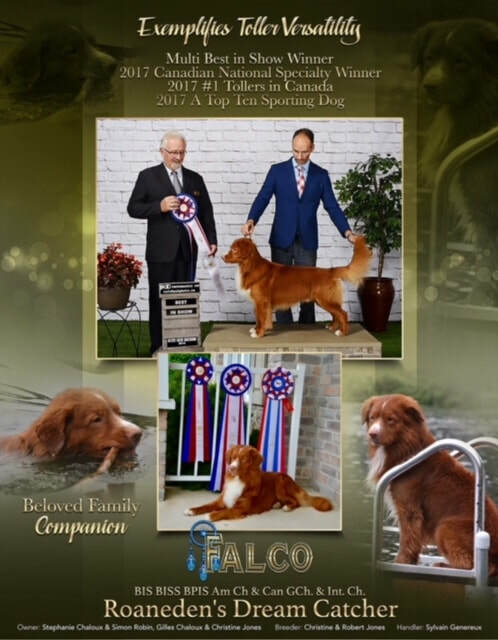 Nov'17 - Caledon Kennel Club - Falco wins Best of Breed all 4 Shows and earns two Sporting Group 3 rds, securing his spot as #1 Toller in Canada for 2017!!!!! 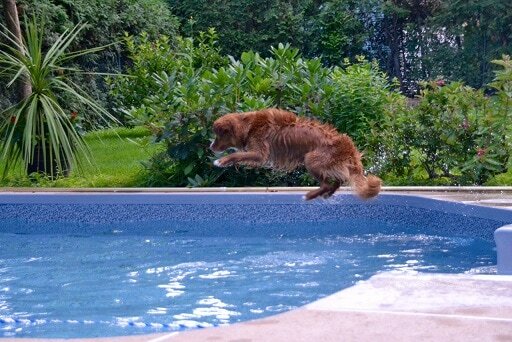 Falco is an active dog ! He is a fabulous companion who is up for anything with his family. 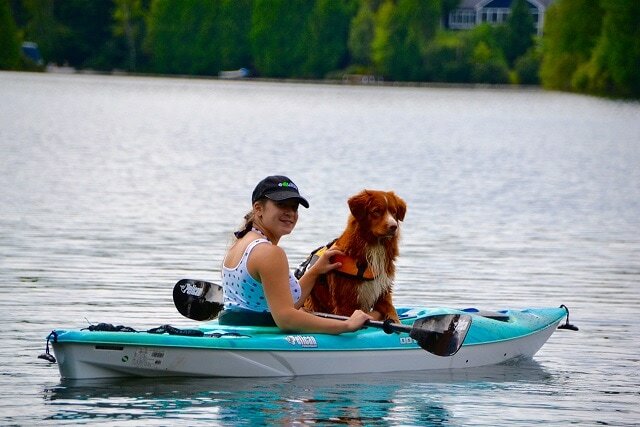 This is one of the things we love so much about our Roaneden Tollers ! 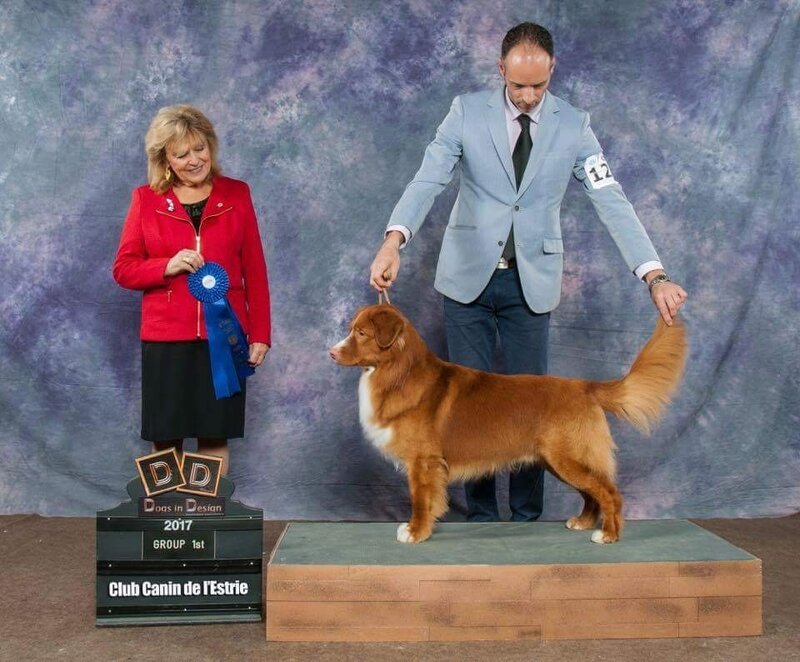 Falco has enjoyed great success in the show ring as a puppy in Canada and the Us ! 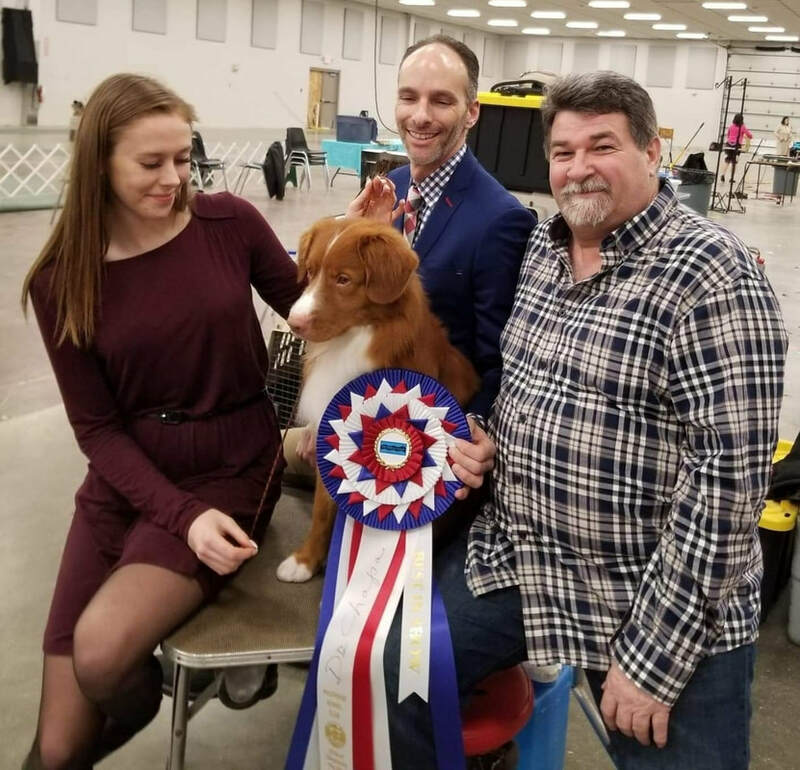 Falco shown with his ribbons earned while completing his CKC Championship - with Multiple awards and a Best Puppy in Show! Falco was shown one weekend in the Us with a large entry, Falco was Best of Breed from the classes two days out of three, made the cut in a highly competitive group and Best of Opposite, Best of Winners the third day ( opposite to his half sister through his sire) Falco earned two 5 point majors and a 4 point major his first weekend shown in the Us. 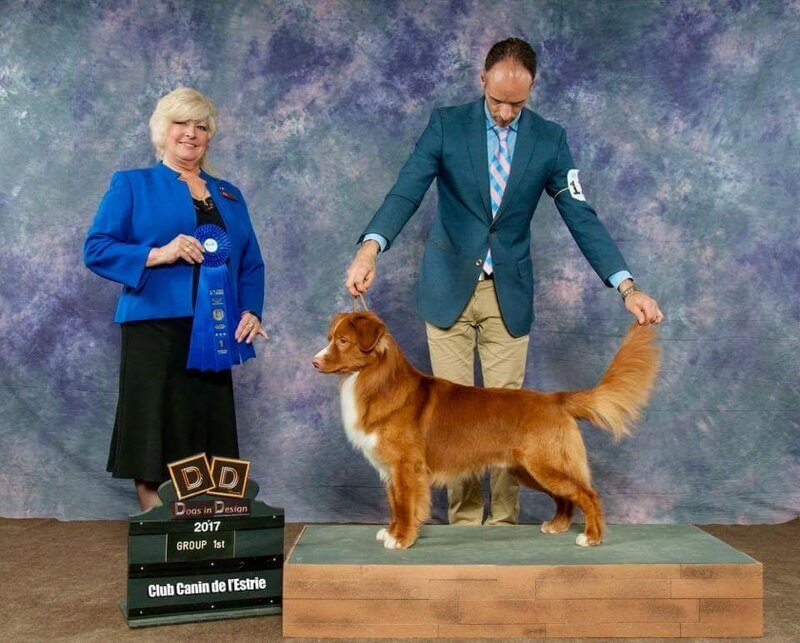 One point to go for his AKC Championship!